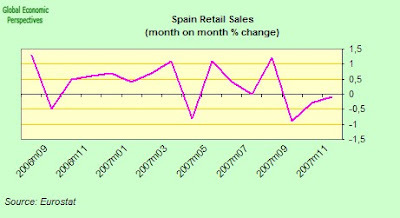 Global Economy Matters: Spains Credit Surge Comes To A Rude Halt? Well, it now seems that everyone plus their aunty is finally catching on to what is actually happening in Spain as I write. The header here is taken from the headline in a Financial Times articule this morning. Only last September, José Luis Rodríguez Zapatero, the Spanish prime minister, announced that Spain had joined the “Champions’ League” of world economies. Europe’s fifth largest economy was growing so robustly, and creating so many jobs, it would soon be richer than Germany in per capita terms, Mr Zapatero predicted. That euphoria was short-lived. December saw a spike in inflation, a rise in unemployment and a slowdown in the economy, as the international credit squeeze gripped Spain. The government recently lowered its estimate for economic growth in 2008 from 3.3 per cent to 3.1 per cent, a figure many economists consider is still too optimistic. Inflation last month of 4.3 per cent was at the highest level in more than a decade. "I’ve been a bank manager for 28 years and I have never lived through a situation as dramatic as this....House prices in this town have fallen by 20 per cent, there is no demand, and no mortgage finance. Savings banks have cut off funding. Before the credit crunch, I used to do 12 mortgages a month. Since August, my branch has approved only one new loan." The picture presented by our regional branch manager more or less sums it all up. For an explanation of why there are no morgages available at this point, and how the credit crunch actually works out in practice see this post here. But also the mention of the regional cajas is significant because of the previous role of AYT Cedulas in the Spanish market. Spains rapid housing expansion was made possible by a process of pooling mortgages from a range of smaller savings banks into one arrangement, creating in the process the euro market’s biggest covered bonds player in the form of Ayt Cedulas. How it was that a small group of previously obscure local savings banks rose meteorically to become the European leader is a story which will be fascinating when someone finally gets to tell it, but for now the important point to note is the danger that this dramatic rise can become an equally dramatic decline. Basically these types of entity are having growing difficulty rolling over their funding, and selling their packages of cedulas hipotecarias, and undoubtedly this difficulty was one of the main factors which lead Jean Claude Trichet to make unlimited finance available to the Spanish banks at 4.21%. Basically, the squeeze on 3 month euribor rates has hit the banks (who have to continually refinance part of their needs and now have to pay nearly 50 base points more - a classic liquidity problem) while the clients - who often pay a mere 0.5% over 1 year euribor - are nothing like so affected. So it is big squeeze time on bank margins. Some background information on the system of Cedulas Hipotecarias and how this works under Spanish Law can be found in my working notes on the topic - which are being updated as I learn more. Among the august and venerable names to be found on a March 2001 2.048 Billion Euro Cedula Hipotecaria Bond Offer were (participaing percentages in brackets) Caja de Ahorros Municipal de Burgos (14.67%), Caja España de Inversiones (14.67%), Caja de Ahorros del Mediterráneo (14.62%), Caja de Ahorros de Huelva y Sevilla (8.80%), Caja de Ahorros de las Baleares (7.34%), Caja de Ahorros de Castilla la Mancha (7.34%, Caja General de Ahorros de Granada (7.34%), Caixa D’Estalvis de Sabadell (7.34%),Caja de Ahorros de Córdoba (7.34%), Caixa D’Estalvis Laietana (4.40%), Caja General de Ahorros de Canarias (1.47%), Caixa D’Estalvis del Penedés (1.47%), Caja de Ahorros de La Rioja (1.47%), Caja de Ahorros Provincial de Guadalajara (1.17%), Caja de Ahorros y Préstamos de Carlet (0.59%). The FT makes quite a fuss about the looming non-performing loans problem - citing real estate developers like Astroc and Llanera who have gone bust, and the rise of 48 per cent in NPLs over the past year (to €1bn) according to data fromthe Bank of Spain, or the fact that banks have €293bn in outstanding loans to property developers. But at the present moment this is not the point. What is alarming about the rate of deceleration in Spain is the rate at which the real economy is slowing, that, and the fact that inflation is spiking when precisely we should expect the deceleration to be producing a downward pressure on prices. My own interpretation of this latter point is that Spain - after nearly 15 years without recession - is unaccustomed to the kind of adjustments which are normal in a society like the UK or the US which see recessions as regular phenomenon. 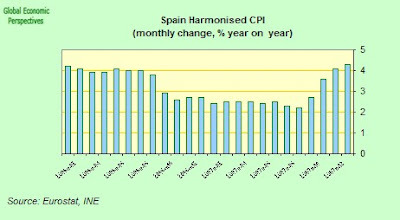 So the reaction and adjustment time is slower in Spain, which might suggest that people are attempting in the short term to compensate for falling sales volumes by raising prices. But this of course won't work, and at some point prices will have to come down if they want to sell (remember that since spain is in the eurozone they cannot devalue to correct price distortions). So the correction process - and particularly if there is a sharp downward correction in house prices (which are reflected in the HICP) at some point, and if there is no further large increase in oil prices which is unlikely - could lead Spain into a downward ternd in price levels, or, if you prefer, price deflation, such as we have seen in Japan. This - if it happens - will produce enormous policy problems over at the ECB, since the eurosystem was never designed to facilitate massive monetary easing a la ZIRP in one individual economy. But then, perhaps we should wait till we get there to talk about this. As I say, I think the problem posed by defaults still lies some way out in the distance. Only as the real economy sinks deeper, and people begin to realise that this is not temporary but long term, will Spains young people really start to throw the towel in in significant numbers. So I think that we should treat each problem a day at a time here, since I am sure there will be plenty of them. Now the data. First off two Items the article doesn't mention. 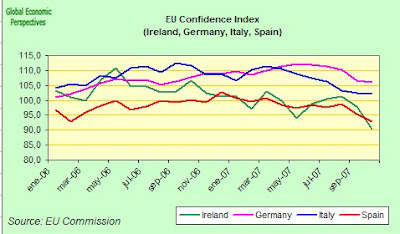 Retail slaes and the EU confidence index. European retail sales fell the most in at least 10 years last November declining by 1.4 percent from November 2006 - the biggest drop since at least 1997 when the data series starts - according to eurostat yesterday. 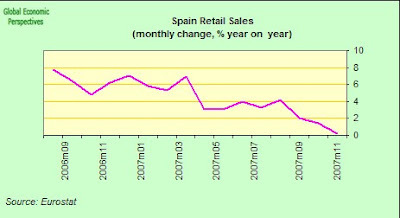 More importantly for our present purposes (although of course Europe wide data is important for a Spain which now needs to export) is the fact that Spanish retail sales declined for the third month in succession. The break that can be seen in both the year on year data and the month on month from the summer is particularly striking. 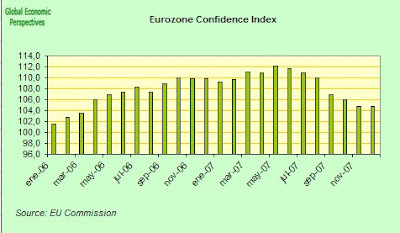 EU Commission Confidence Index Down All Round. The general picture of an economic slowdown in the eurozone is once more highlighted by yesterday's realease of the December data for the EU Commission Eurozone Economic Sentiment Index. The Commission’s economic sentiment indicator is on a clear downward path. At 104.7 in December, down from 104.8 in November, the index was at its lowest since March 2006. But perhaps more important than the steady downward drift in the general indicator are the individual country differences. Spain is demonstrating that prospects could vary significantly across the eurozone. Since September, confidence in the Spanish construction sector has tumbled, and the Commission’s survey results showed sentiment deteriorated in December in Spanish industry, retailing and among consumers as well. As the FT point out, unemployment is now trending up, and the underlying situation is reflected in the shifting pattern of employment and unemployment. In this context a comparison between 2006 and 2007 is pretty revealing. If we look at the chart below we can see that in the early months of this year the employment situation was generally up over 2006. Then the situation turned (around July), and since then it is "down hill all the way" unfortunately, with unemplyment rising (as it might well do for seasonal reasons anyway, but in every case the increase is significantly more pronounced than in 2006. 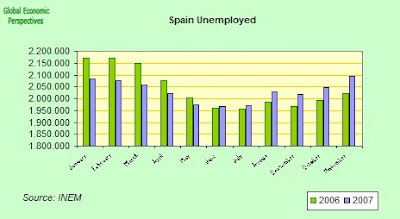 Spain's ever productive labour market has, unfortunately, now turned. As the FT also points out, inflation is on the way up againin Spain,and accelerated in December to the fastest pace since the euro was introduced in 1999. Consumer prices gained 4.3 percent from a year earlier when measured using the EU harmonised index, compared with a 4.1 percent increase in November, according to data from the National Statistics Institute. 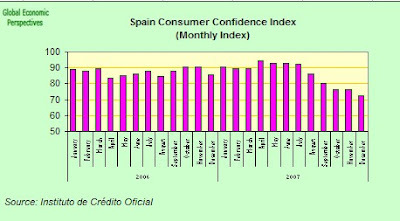 Not surprisingly, in this environment consumer confidence is plummeting, touching historic lows for the third month in succession in December, according to the index compiled by the Instituto de Credito Oficial. OK, since I have already repeated myself enough, and time is of the essence at this point in time, if you want a fuller explanation of some of the points being argued here, please go over to this post.